Tally Me Banana is a Donkey Kong minigame in Mario Party 6. Its name is taken from a line in "Day-O (The Banana Boat Song)" by Harry Belefonte. It appears to take place in a tropical area of some kind. The Blooper from the minigame Blooper Scooper can be seen in the top left corner of the screen. The introduction shows Donkey Kong jumping on a barrel and collecting a banana. 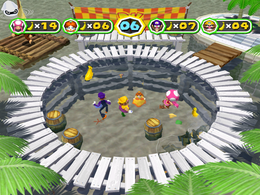 Players jump on the barrels scattered throughout the pool to collect as many bananas as possible. If the player misses a barrel and land in the water, they are out for the remainder of the game. Most barrels contain a single banana, though some contain banana bunches, which give the player five points rather than one. Rules – "Jump from barrel to barrel without falling into the water to grab the most bananas!" Advice 1 – "Barrels break as soon as you land on them. Bounce immediately to the next barrel to avoid falling in!" Advice 2 – "Use opponents that have fallen into the water as stepping stones to reach more barrels." Spanish ¿Cuántos plátanos? How many bananas? This page was last edited on January 19, 2018, at 14:00.